indiana bloggers have been complaining about those pesky "in god we trust" license plates since they came out last year. it's not just that they're a blatant, unconstitutional government endorsement of christianity. the biggest problem with the plates is that they were distributed at no extra charge. this means that not only does the state lose money on each IGWT plate it sells, since the IGWT plates are more expensive to produce, but that other specialty plates were unfairly impacted, effectively taking money away from local nonprofits. thanks in large part to the 1.5 million IGWT plates sold last year, 47% fewer environment plates were sold. 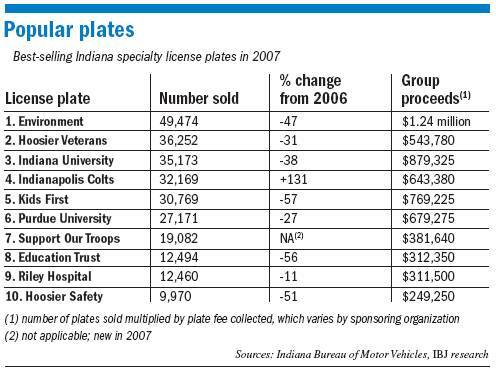 that means that the state environmental trust that benefits from those plates received 47% less money from license plate fees in 2007.
similarly, indiana kids first saw a 57% decrease in license plate revenue, the education trust got hit with a 56% decrease, and hoosier safety gets a 51% decrease. IU and purdue saw 38% and 27% decreases, respectively. only the mighty marketing machine at riley hospital escaped relatively unscathed, with only an 11% decrease. Not all Christians support the IGWT plates. Many of us feel they are wrong. Can you prove to me that these people just didn't want to front the $20-$45 or so it costs for a special plate? You can't. If the economy is that bad, doesn't it make sense people might opt for a free plate over one they used to pay for? 3:38: i didn't mean to suggest otherwise. but obviously a lot of christians do support the plates. 4:12: can you prove to me that the IGWT plates weren't most of the problem? you can't. I think the state pushed these plates because they had just about run out of traditional style numbers in several counties. It seems that they were actually pedaling the plates over the regular ones (at least in Marion County). I don't know how the "In God We Trust" theme was selected (not in the usual fashion, I'm sure). And, it was much more devisive than it needed to be, had a more neutral message been selected. Just somebody in the administration shooting from the hip because the BMV management got caught with their pants down over the numbering issue. Business as usual for Governor Daniels' political hacks.